Cosmos with an otherworldly glow of pink+green, orange+yellow and blue+purple. I took the photo at a flower park and added patterned texture for color and interest. It's October (already)! My latest 3D render is rightly autumn-ish: A contemporary room with sparkling white walls and polished grey granite floors serves as the perfect space for a trio of digital art, Resurrection lilies in autumn hues. Read more on my design blog. 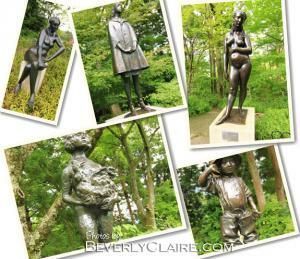 A few thoughts on the movie "Citizen Kane" and a sampling of the beautiful bronze sculptures at the Hakone Open Air Museum in Japan. Read more on my travel blog. 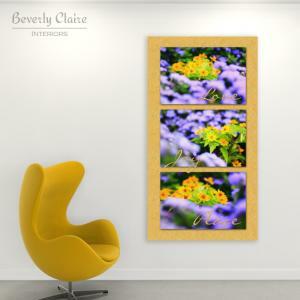 A series of images of Melampodium paludosum, also known as Gold Medallion flower. Enjoy the bright, cheerful yellow petals against the violet bluemink in the background. I took the photos at a flower park and added textures for a painterly look. A background of yellow Japanese washi paper enhances the colors. 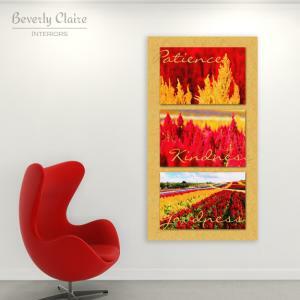 The words "Love, Joy, Peace" adorn each image. 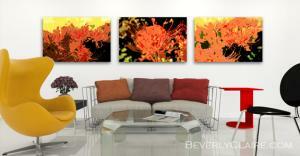 This is the first installment in my "Fruit of the Spirit" botanical series. Read more on my photography blog. 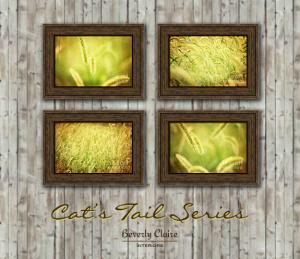 A field of cat's tail, also called foxtail or bristlegrass. They were growing on an abandoned lot next to a large bridge in my neighborhood. Read more on my photography blog. 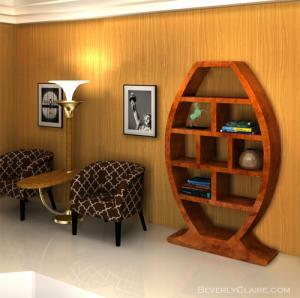 I made 3D models of an Art Deco bookshelf and uplighter, and rendered them in a virtual room. The framed black-and-white photos of Ellis Island and the Statue of Liberty I took in New York during a visit there. Read more on my design blog. 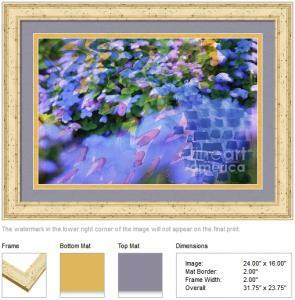 A framing idea for the work "Ageratum or Bluemink with Watercolor Brushstrokes Overlay". 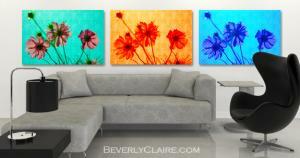 A colorful interpretation of the Ageratum. The flowers are called Bluemink but the color is closer to lavender than blue.I took the photo at a flower park and then added an overlay of lavender, yellow and blue watercolor brushstrokes. 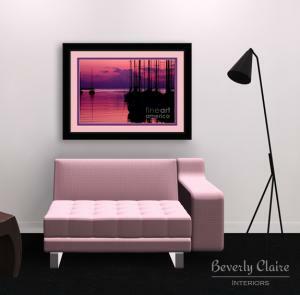 This image is available as an art print. Cute little wild mushrooms growing under the trees in a museum park. Read more about the Sezon Museum of Modern Art over at my travel blog. 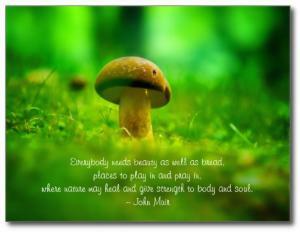 Forests and Lakes postcards as well as Wild Mushrooms gifts are available in my gift shop. Art prints are also available.